Even a little bit of power is a wonderful thing when the grid goes down. This is especially true for the millions of us who rely on wells for water. Without a generator, no power can mean no drinking water, no flush toilets and no cooking. The hidden danger is that most generators can cause damage to the kind of sensitive electronics that are part of a lot of items these days. Regular generators are fine for fridges and freezers and water pumps, but they’ll fry computers, cell phone chargers, the electronic controls on appliances and even some cordless tool battery chargers. That’s why not just any generator will do if you really want to prepare yourself for long-term self-reliance when the grid goes down. The most versatile portable generators offer tri-fuel capabilities, able to run on gasoline, natural gas or propane—whichever is available. The Honda EU2000i inverter generator is very quiet, easy to carry, and fuel efficient, making it ideal for TVs, small appliances, and basic lights. The stable power allows for safe use of computers and other sensitive electronics. With a very low 59 decibels at max power, it is perfect for an inconspicuous source of power. It is small—about the size of a gym bag—and light, at only 47 pounds. It can last nearly 10 hours on one gallon of gas and can provide 1,600 watts of continuous power. The fuel economy switch on this unit extends the run time, while the low oil shutdown feature protects the engine in the event there is an oil consumption issue. It works at a various engine speed to produce a very constant 120 volts at 60 hertz, and has a remote electric start with a recoil backup. Slightly noisier that others in its class, it has a respectable run time and can be paralleled (cable included). Rated at 2,000 watts of continuous power (2,200 surge), it has the largest engine displacement (127cc) with the lowest run time (5 1 ⁄ 3 hours at quarter time), but this is in part to its small fuel tank (one gallon) coupled with the large displacement. It has an electronic overload protection circuit breaker for its three receptacles, while the LEDs display the status of the generator. It can also be used to charge 12-volt batteries. the large displacement. It has an electronic overload protection circuit breaker for its three receptacles, while the LEDs display the status of the generator. It can also be used to charge 12-volt batteries. This inverter shares the top spot with the Northstar conventional generator as the most expensive. For that money, you get the longest run time (20 hours) and the most continuous power (2,800 watts) with the largest gas tank and the quietest motor (a whispering 49 decibels). It is CARB-compliant and can be sold in all 50 states, has an electric start, and two handles for easy loading (though it is over double the girth of other inverters on the list). This conventional generator is at the top end of the price range, but it uses the Honda GX390 OHV engine as its power source, and provides the most outlets of any model on the list (10, including four duplex). The unit is wrapped in a full roll cage and has a solid base to prevent dirt and debris from getting into the engine. It is designed to cut down on vibration, but it is the noisiest on the list (at 74.5 decibels). The 11-hp engine uses up its 6.5 gallons of gas in 10 hours (at half load). full roll cage and has a solid base to prevent dirt and debris from getting into the engine. It is designed to cut down on vibration, but it is the noisiest on the list (at 74.5 decibels). The 11-hp engine uses up its 6.5 gallons of gas in 10 hours (at half load). This model tips the scales as the heaviest conventional generator on the list, at 230 pounds, but provides one of the longest running times at 13 hours (at half load), producing 6,500 watts of continuous power. It has the largest displacement engine with the biggest gas tank. It starts with a pull cord (recoil start) and has five receptacles. When you’re shopping for a generator, it can get confusing to read the various technical specs – especially when you’re pondering how starting watts differ from running watts. As the name suggests, starting watts are only needed for the first few seconds to jumpstart and power up your electronics. It’s important for your generator to have enough starting watts to power your electronics or else you won’t be able to turn them on in the first place. Before buying a generator, make sure it has enough power to start your most powerful electronic, such as your refrigerator. If it can start it, it should be fine for everything else. Running watts, also known as continuous watts, refers to the power that keeps your electronics running for the hours to come. It’s important to look at the electronics you’ll be running and the power they require. The last thing you want is to be left in the dark after only a couple of hours. Some electronics or appliances don’t list their running watts, so you’ll have to estimate yourself. To estimate, you can use the following formula: Watts = Volts X Amps. A good rule of thumb to remember is that starting watts typically require three to five times more power than running watts. IF A STORM OR OTHER CALAMITY shuts down power to your home for an undetermined amount of time, there are quite a few systems that it will eventually adversely affect, from the food in your fridge to the climate of your house to the use of the computer or to keep communications up and running. We take the grid for granted when it runs smoothly, but throw in a heat wave or something slightly more nefarious, and panic can grip a neighborhood when the lights go out. Generators can provide a little piece of mind in an emergency such as this, and there are many on the market, all offering subtly different features; it is difficult to tell which one would be right for you. The generators on these pages are conventional and inverter generators, the two most common types that offer some portability, relative economy, and the minimum needed power to operate a few essentials. Conventional generators have been around for quite some time, and they consist of a fuel-powered motor running at a constant speed to produce a standard current that most houses and appliances require (120 volts at 60 hertz). If the engine’s rpm fluctuates, the output will also fluctuate. An inverter generator is somewhat of a new technology, taking advanced circuitry and magnets that create three-phase AC current, converted to DC, and then inverted back to AC as a single phase current. Which one is better can only be answered by what usage the generator will see, how much current will be required of it, and how much you are willing to spend. The inverter generators are lightweight and very portable. Since size and weight isn’t an issue with conventional generators, they have larger gas tanks and longer run times than inverters. However, the inverters have more efficient engines and can adjust the engine speed based on the load required (conventional generators typically run at 3,600 rpm, regardless). Because of this, inverters are built to be very quiet, as most are around 50 decibels, which is about the same noise as a normal human conversation, while conventional generators are in the 70-decibel range, which is about the same sound as a car driving by. A good thing about inverters is their ability to be paralleled together to increase the power output. Most of the ones featured here can be connected together via a sold-separately cable to double their power output (from identical models). That’s an interesting possibility, but some appreciate the simplicity of the conventional generator, which is basically an engine with an alternator attached. There are no extra features to go wrong, and the systems and concepts used are decades old. Price is always a huge factor, and although the price of inverters have come down in the last few years and will continue to drop as the technology ages, conventional generators provide more power per dollar than inverters. What is “inverter” technology ? It might be daunting to hear generator terminology if you aren’t familiar with it, but you can break down the specifics of an “inverter” generator with these quick tips from Spencer Savage, general manager at Yamahagenerators.com. “The biggest difference between a standard generator and an inverter is an inverter model provides a pure sine wave of clean power,” Savage says. “The pure sine wave is required to power today’s electronic devices which have microprocessors like computers, TVs and microwaves.” Standard generators take their power directly from the alternator, which is fine for powering non-“intelligent” devices like power tools or lights, Savage says. Inverter models are perfect for powering RV’s or for dry camping. “In choosing an inverter, you need something light-weight and powerful,” he adds. Therefore, if your generator needs require you to power anything electronic, then you need an inverter model generator. If you are only powering lights and power tools like on a construction job site, then you’ll simply require a standard generator. Portability: If you experience frequent storms—for instance, if you’re in a hurricane zone—you may want to consider a stationary generator, which an electrician can install permanently, allowing you to immediately have power no matter what befalls your home. If, however, you want the flexibility of a portable generator, you should choose one that’s easy to transport. These can be moved from room to room to suit your needs. For instance, you might keep it in the family room to power your computer during the day and then move it to your bedroom so you can run a fan while you sleep. Low oil shutdown: This will keep you from facing costly repairs down the line. Find a generator that immediately turns off when the oil is low. for your generator, because the options fluctuate from one unit to the next. Warranty: Get the longest manufacturer warranty possible. With an investment this big, you don’t want to chance the generator breaking quickly and find yourself out of luck and in the dark. Although all generators create power, not all generators are created equal. Let’s take a look at some key features to look for when you’re in the market for a portable generator. Automatic Voltage Regulation: You know how you should turn off sensitive electronics during a thunderstorm like your computer and TV? The automatic voltage regulation stops voltage fluctuations during storms that may harm your device. Automatic Safety Shutdown: You don’t want to drive your car when it’s out of oil. The same can be said for your generator. As the name suggests, automatic safety shutdown powers down your generator if it has low oil pressure, low oil level, low coolant level, high coolant temperature and other conditions that can ruin it. Circuit Breakers: Similar to your house, generators come with built-in circuit breakers. Not only do circuit breakers regulate the flow of power, they help protect connected electronics by turning them off in the event there’s too much current passing through them. Wheel Kit: Who wants to carry around a heavy 50-pound generator on their back when they don’t have to? Wheel kits are a must, especially on heavier, more powerful models. 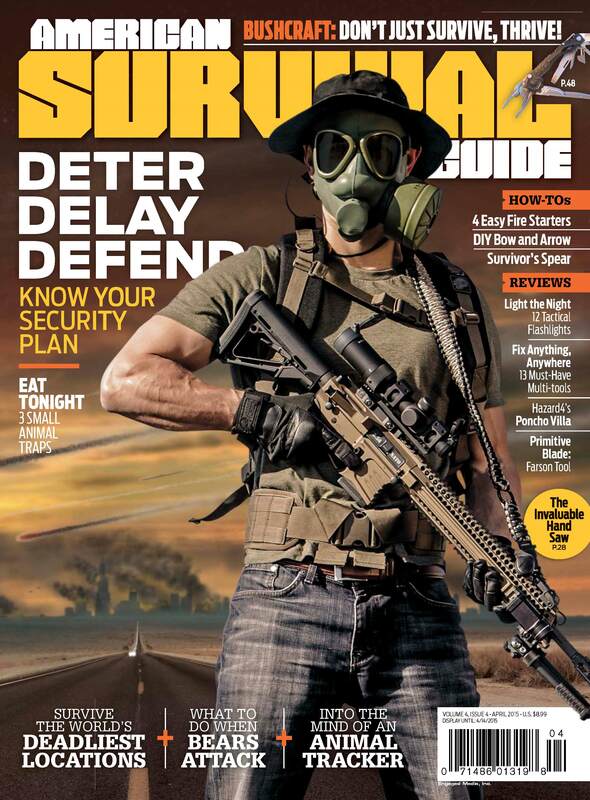 Editors Note: A version of this article first appeared in the December 2014 print issue of American Survival Guide.